Okay, let’s look at that. That’s a commonly misunderstood concept. Always consider the context. He says, “If any man come after me, let him deny himself, take up his cross daily, and follow me” (Luke 9:23). This is Verse 22, the verse before the one in question. “The son of man must suffer many things and be rejected by the elders and the chief priests and the scribes and be slain and be raised the third day.” So, in the context of how he was playing with the public, he warned them that He Himself was headed to the cross, to rejection, and to death. Well, within a few hours, Peter was denying Jesus Christ. So Peter didn’t follow Jesus to the cross. The Bible said he and the disciples “stood a great way off.” He is challenging them to follow him in His sufferings and in His death. In other words, instead of being three crosses on the hill, four with Peter, five with John, six with Andrew, and so forth. “So if any man will come after me, let him deny himself, take up his cross daily and follow me.” Now, when he said, “take up his cross,” we know what that is. As we look later on, Jesus is bearing the cross, he falls down, and they compel Simon, one of Cyrene, to bear the cross after him. So Jesus is carrying one end of it, Simon is carrying the other end of it, and they’re carrying the cross. Any time that the city of Jerusalem saw a man carrying a cross through the city, outside to Golgotha where he would be crucified, they knew what he was doing. He was a dead man walking. He was heading to his death. Jesus said, “If you’ll come after me, take up your cross daily.” In other words, you must be prepared at any moment to die, because it could happen at any time. So every single day as you follow me, be prepared to do what I do, which is die for this teaching that I have. Then he goes on to say, “For who so ever will save his life shall lose it; but whosoever will lose his life, for my sake, shall save it.” And so He’s saying if you depart from me, you deny me, you lose your life, but if you go ahead and follow me all the way you save it. If we were to draw an application of that passage beyond the original context, what would it be? Well it’s obvious. There was recently a man, a Christian in Iran, who had the death sentence upon him. He was a pastor. He was preaching the gospel, and it’s illegal there to be a Christian. So they told him if he would recant, if he would deny Jesus Christ, and come back into the Muslim fold, then he would not be executed. I was praying on this end, that he would take up his cross and follow Jesus, deny himself, for God’s sake, and for the gospel’s sake, and in so doing save his life. Otherwise, if he denied Christ he’d lose his life. So it’s this contrast, if you think, if I deny Christ I’ll save my life, I won’t die. He said, no, if you go ahead and confess me you may die, but you’ll save your life. He’s kind of got a turn on words and concepts there. Now there’s quite a few other passages, maybe a dozen, maybe not that many, six of them, eight of them, in the New Testament where people have developed this doctrine of this daily dying to self, this self-introspection, this morbid putting away of self‑motivation, self‑aggrandizement, self‑pleasure, and sublimating your humanity to some sort of a morbid austere spiritualism. I’ve known so many people like that. They’re all nauseous. It really came out of the Keswick movement in England. It’s the concept that we must, or God must, God or us or both, must do this work inside of us. Books like the Calvary Road, Roy Hession, Norman Grubb, Iron Thomas, Andrew Murray, wrote a lot about this concept of daily experiencing this inner crucifixion of self. That’s not a biblical doctrine. It’s totally contrary to the Bible. It’s anti‑Christian, it’s anti‑Bible. It’s really a doctrine you’d find in Buddhism. Some of our missionaries come back and they say, “That’s the very doctrine.” In fact, the doctrine originated a whole lot out of Eastern teaching, and it is an Eastern mysticism rather than a Christian doctrine. It’s amazing how it perpetuated in spite of the clear teaching of Scripture, but that’s the meaning of the passage. Lori, am I misunderstanding or is this the transcript of Micheal Pearl’s Q&A? I had a little trouble wrapping my mind around this post, and had to read it through several times until I had an idea of what was bothering me. We recently studied this verse (verses as he pointed out) and it’s kinda strange to hear another explanation. I get what he’s saying, context does matter (hugely) and there are so many people blindly leading others around with false doctrine it’s a sinful shame. I’ve never been one to sit back and accept my femininity (aka just go along) to the point of not holding up what I hear and read to biblical truth and theology. In fact, mothers (like me) should make it a point to know true theology in and out so we can rightly teach our children. So, if Christ didn’t mean for everyday to be a “dying to self,” he wouldn’t have added the word ‘daily’. We may not all be called to follow his cross of sacrifice, and be bodily persecuted. But we are all called to follow his obedience to the Father, and his work of the ministry. Christ was sinless, selfless, and perfect in every way. He was lowly, esteemed not, a man of sorrows and acquainted with grief. He was despised and rejected of men (read Isaiah 53). He went to the cross in obedience, knowing it was the only way he could atone for the sins of his people. Is this taking up the cross and following only something we do when faced with persecution? Yes, but as a student of scripture I know it is more. It is a daily working out of our salvation, following Christ’s example in love, kindness, serving others, seeking others’ well being above our own, and truly understanding and knowing God’s steadfast love, justice and righteousness. Christ made himself nothing for us. Does this sound like a wrongly lived “self effacing” kind of life? Not false piety or holier than thou, but his was a humility and meekness very foreign to today’s standards. This is not a false spiritualism. This is true putting to death the selfish, sinful inner self, and living in the freedom of Christ’s redeeming work. And because we are bound to our sin prone bodies, it is a daily work. I know this is long winded and meandering, but I know people who live and breathe this daily cross bearing (all our crosses are differently given by God) and it is a beautiful thing. And the Bible is filled with those who followed Christ with everything in them. I strive daily to follow Christ by taking up my cross. And it’s not done with regret or frustration, but in peace and faith. Christ, who so perfectly served and obeyed his Father while on earth and ultimately to the cross, is my daily inspiration. And I seek to study Scripture diligently, in order to rightly divide the truth of God. PF, maybe this writers explanation will help your understanding for what Jesus meant, although he writes a little bit sarcastic for the first example of interpretation but I think you will get the point. 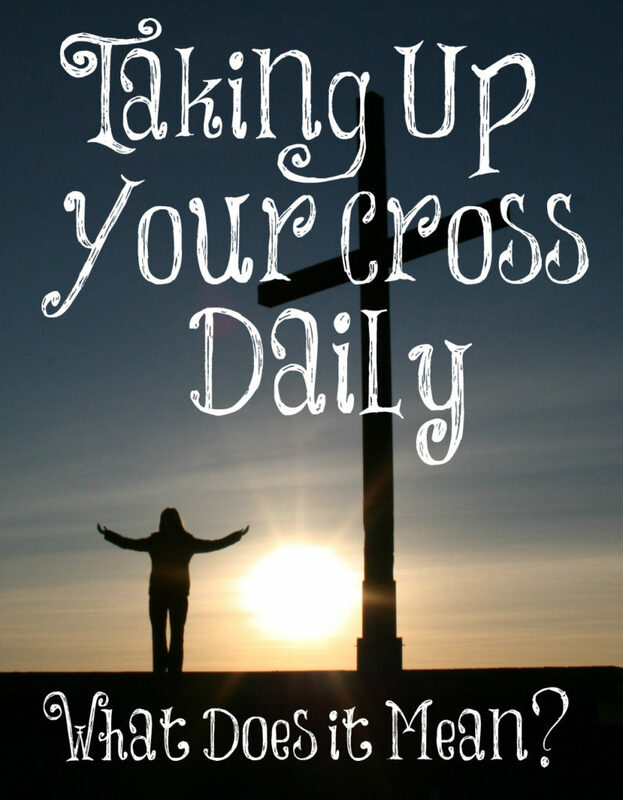 What does it mean to take up your cross daily? I’m going to give you two interpretations and then you can choose. Following Christ is all about self-denial and going without. If you are not in the daily habit of denying your appetites and desires, you are not a real Christian. The more you deny your own needs and wants, the holier you’ll be. So fast everyday and you’ll be just like Jesus. But there’s a problem with this interpretation. Abstaining from food, Facebook, or fun won’t make you righteous and holy. (It might make you religious.) This message of self-denial is nothing more than the ancient practice of asceticism dressed up in religious jargon. It is a message that promotes Pharisaical self-righteousness and DIY religiosity. Jesus did not suffer and die on the cross so you could join him in suffering and dying on a cross as well. That’s not good news. Jesus died so that we might be free from this sort of dead and useless religion. When you were baptized or placed into Christ, you were baptized into his death (Rom 6:3). This is just about the single most important thing that ever happened to you, yet many Christians are unaware of it. Since they don’t know that they died, they are constantly trying to die. But the gospel declares, “You died.” You have been crucified with Christ. The person you used to be – dead in sins and alienated from the life of God – no longer lives, but Christ lives in you. Adam Clarke may be right. I wouldn’t know. I don’t have the original manuscripts. But for the sake of argument, let’s assume Clarkey is wrong and our English Bibles have it right. What then? My view is that Luke is on the same page as Matthew and Mark but he is emphasizing something to make a point. Luke isn’t contradicting Matthew and Mark; he’s saying the exact same thing – the way to salvation is through Christ and his cross – but he’s saying it with gusto. He’s saying we ought to value the finished work of the cross every single day. When I get out of bed in the morning and put my feet on the floor, my left foot says, “Thank you, Jesus,” and my right foot says, “For the cross.” It’s because you have died with Christ that you now live, everyday, in union with him. This is a great treasure and not something to take for granted. “Paul, are you saying that if I stop valuing the cross I’ll lose my salvation?” Not at all! I’m saying if you have been born of the spirit, learn to walk by the spirit. We don’t die daily – once will do the trick – and we don’t get born again every day. But every day we make this choice: Will I walk after the flesh or after the spirit? Let me give you an example. Say you hear a message that says you need to fast and pray to become spiritually mature, so you decide to fast and pray. Bam! You are no longer walking by the spirit. You are no longer trusting in the grace of God. Rather, you are trusting in your own fasting and praying performance to make you mature. Where does the Lord fit in this picture? He doesn’t, and that’s the problem. Dead religion is a graceless and faithless way to live. There is nothing wrong with the phrase “die to self.” The problem is we read it through Buddhist lenses instead of gospel lenses. We think, “I have to stop being who God made me to be. I have to pretend I’m somebody else – someone who doesn’t enjoy wine, one woman, and song.” That’s a dehumanizing doctrine of demons. “Die to self” means “Trust Jesus instead of the flesh.” It means live each and every day out of the glorious relationship you have with the Lord. It means, don’t fall back to the inferior ways of the flesh that you walked in when you were a sinner or religious, but stand firm in the freedom of Christ. This, I believe, is the point Luke was trying to make. The trusting life is an adventure. It’s good to remind yourself daily that “God is for me. How can I fail?” Conscious of your loving Father’s acceptance and approval, you will soar on eagles’ wings. And when you apprehend, by faith, the inexhaustible riches of his grace, the whole world benefits. You are right that we DIED with Christ and now we are new creatures in Him. We don’t have to do this silly stuff of “dying to self” that many teach to die because if we are believers, we are dead and alive in Christ. I disagree that we aren’t to suffer for Christ. There are many verses about being willing to suffer with Christ and even die for Him. All of Christ’s disciples were willing to die for Him and they all did. And I could give you many more. In the context that Paul wrote this verse, PF, he meant that we must be willing to die for our faith daily. Period. There are many other verses about walking in the Spirit, hating evil, walking in newness of life, putting on the armor of God, etc. but this particular verse in context is being willing to die for what we believe in. The only purpose of the cross was for Christ’s death and many of his disciples died the same way, for their faith. I have never said, “I die daily” or anything like this. I want to walk in the Spirit and be obedient to Him in everything. Yes, I am willing to die for Him (take up my cross daily) because this is what He calls us to do. Lori, what you wrote I believe explains it very well thank you ! “In the context that Paul wrote this verse, he meant that we must be willing to die for our faith daily. Period. I think it’s limiting to say this taking up the cross and denying yourself only means a physical dying for Christ. It’s limiting the richness of expounding Scripture with Scripture. So you could say that Biblically there is a dying each day, especially with our sin nature that will never be conquered until we are free from our earthly bodies. Even Paul, righteous man that he was, farther along his path to sanctification than most all of us, declared himself the chief of sinners. I know there are so many people who are set against you and willing to destroy your ministry. I am not one of those, but it saddens me to see Scripture being limited by one view of one man. Context is a big issue. But, are we limiting God when we say this alone is what He meant when He allowed these words to be recorded for us? There are some He calls to bodily persecution and death. Others of us have different crosses to carry, and we all must deny ourselves everyday, and put to death our sin. Scripture is the best commentary of Scripture. Look deeper, it is a rich resource. Limiting this verse would be saying the promise to Adam and Eve in the garden had nothing to do with a baby born in Bethlehem. Or the countless stars pointed out to Abraham has nothing to do with every true believer today. As Christians we are called to try every word. It is a noble goal, searching Scripture for ourselves. Scripture is very clear that once we believe, we have died with Christ and risen as a new creature in Christ. Romans 6 says 6 times that we are dead and freed from sin. The KJV in Col. 3:5 states it this way, “Mortify therefore your members which are upon the earth; fornication, uncleanness, inordinate affection, evil concupiscence, and covetousness, which is idolatry:” Mortify means to “subdue (the body or its needs and desires) by self-denial or discipline.” We can’t kill something that has already been killed! You wrote “So you could say that Biblically there is a dying each day, especially with our sin nature that will never be conquered until we are free from our earthly bodies.” We don’t need to die each day because we have already died with Christ and risen with Him to a new life in Him as the verse so beautifully states. Once we are saved, God and Paul calls us saints. He said he was the chiefest among sinners because he murdered Christians before he was saved. I agree we must deny ourselves but this makes sense, is scriptural, and something that everyone understands. We don’t have to “put to death our sin” since we are dead and freed from sin which is clear in the Word and even the verse you quoted from Romans 6. Now, we have to continue to believe that what Christ accomplished on the cross means we are freed from sin. Yes, we will still sin but our focus should be on what Christ has done for us and walking in the Spirit, plus disciplining our bodies as Paul as clearly stated. I have studied the Word since I was 18 years old and all throughout Scripture, what I just wrote is what I clearly see. Here are a few posts I have written about this topic. I love my new life in Christ, that He has done all the work, and now I have to walk in the freedom He died to give me!